I used to like my weekends. Now I loooooove my weekends! It’s not that my new job is unbearable, but it is very tiring. I’ve resorted to taking occasional naps after work, and the weekends are necessary for catching up on rest. This week, more students trickled into Bonnabel. We still haven’t yet reached 1,000 out of the 1,8000+ original students. Nine joined my classes, and two transferred out after being deemed qualified to advance to a higher math class. Perhaps against the interest of keeping my class numbers up, I had arranged for one of them to see the academic counselor. He clearly belonged in an honors class. It turned out that no honors class was available during that period, so instead he’s being allowed to skip my class for the first half of the year. He’s scheduled to rejoin me for the second half, if I’m still around. Except for the fact that this student was bored by the pace of the course, I enjoyed having him in my class. I wish I could say the same for all the new students who reentered this week. They brought my headcount totals up to 20 (period 2), 20 (period 3), and 12 (period 5), but I would not have minded if a few of them stayed home! As every teacher confirmed before I entered this field, about 10% of the students cause 90% of the headaches. In the first week since the hurricanes, I had one primary troublemaker in period 3. Ms. Bigmouth #1 is the “Emotionally Disturbed” ringleader amongst a handful of second-class offenders. The days were reasonably peaceful when I could keep her under control. Then in the second week, Mr. Bigmouth #2 joined period 3, and the two joined forces to rally their little followers into a barrage of outbursts and disruptions. Things got a little chaotic in that class. If I create a big spectacle confronting the troublemakers in front of the whole class, I know they won’t back down in the presence of their peers. My approach has been to keep disruptive students after class for one-on-one talks. When all alone, their bravado breaks down and not a single one has had the courage to look me in the eye. I hold some hope that my individual discussions will bring a few of these children around, but I strongly suspect that I will have to hand out more lunchtime detentions next week. How I might appear in some students' yearbooks. In period 2, Mr. Bigmouth #3 was added to my roster on Tuesday. On Wednesday, he earned his first private discussion with me by addressing me as “Hey, Slim.” After I had so strongly emphasized the role of respect in my classroom, I explained to this student that such informality wouldn’t be tolerated. Thursday he upped the ante with multiple disruptions, and by answering a cell phone text message. School rules don’t allow students to use cell phones, so when he refused to put it away or hand it over to me, I sent him to the discipline office. Friday morning I saw his name on the list of suspended students. I admit that I enjoyed my period 2 class much more without him, but I wasn’t completely satisfied with the outcome. I don’t think taking him out of school is the best solution, but on the other hand I will not allow him to continue stealing class time from other students who are willing to learn. I hope that when he returns next week, we can work out an “understanding” about his behavior. Based on much advice I’ve gotten from veteran teachers, and my own intuition, I’ve tried to run a fairly strict classroom. As they say, it’s much easier to loosen your grip on the students than to tighten it up later. I gotta believe this is the best approach for a new teacher, but sure hope to achieve that ideal balance where I’m working with all of them instead of constantly battling against the Bigmouths. I wish someone would observe me in my classroom, so the school administration would know that it’s worth fighting to keep me if there’s any negotiation during layoffs. Or, if I’m not worth trying to keep, I’d at least like to know why! I get along with the rest of the faculty very well, but I know my winning personality isn’t enough to keep my job. 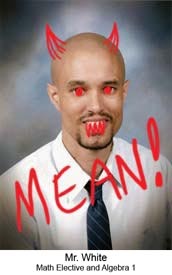 In any case, some feedback on my teaching effectiveness and classroom management skills would be useful. I’ve spent four of my planning periods observing the classrooms of two other Algebra teachers, trying to pick up ideas and techniques. For whatever reason, I don’t see as many behavior problems in their classes. I’m still trying to figure out if I just happened to get more difficult students, or whether there’s something I can do to calm down the Bigmouths. On Friday, a new girl was added to my period 2 class. This is the class in which almost half of the students are native Spanish-speakers who know little or no English. So, the fact that she also knows almost no English isn’t unusual. The difference is, she’s from Russia. Shoot, I don’t speak Russian. We’ll see how this goes. Except for the two buildings that have been condemned, Bonnabel looks like a pretty normal school again. Relocated teachers seem to have settled into their new rooms, and the mad shuffling of students’ schedules has died down. I believe I heard that we also have our gymnasium back. A group of police officers (about 150, I read somewhere) from New Jersey had been using the gym as a base and sleeping quarters during the rescue effort. I didn’t see it for myself, but I heard they had quite a self-contained setup in there. I did notice when driving along Interstate 10, I no longer saw the several dozen squad cars that had been stationed behind Bonnabel since my return to Kenner. Apparently they all returned back to New Jersey earlier this week. We have one of our big copy machines up and running again, so teachers can resume duplication requests. I’m keeping my fingers crossed that the machine stays in good working condition. Life still is creeping back towards normalcy at a very slow rate. Many businesses in Kenner have yet to reopen, and many of those that have reopened only have very limited hours. On the other hand, some businesses are obviously doing very well in the wake of the hurricane. Any grocery store that has been able to reopen is enjoying huge crowds, since most of their competitors are still closed. Signmakers are making a killing out here. There are scores of “Help wanted” and “Such&such business is now open” signs along major streets and intersections. Business is booming for tire sale and repair shops. Saturday I found nails in each of my front tires. I had them both plugged, but one still leaks. I guess I’ll have to buy a new one. On Sunday evening, my TGNO friend Michelle was driving down the major interstate, having just picked up her new dog (More on that…) Several miles from my apartment, her tire blew out. I drove out and changed it for her. The very next day, the little dummy spare tire blew when another of her friends was driving the car over to get the first tire replaced. She had to have her car towed. I was mentioning this to a coworker on Tuesday, and she walked over to check the tires on her car. She found a nail in one of them. Thanks, Katrina. Michelle & her new doggie Bastian (That's Michelle in the top photo). Coming soon, an updated photo of them both together. For years, Michelle has wanted a pet collie. Earlier this summer, having finally moved away from her home in Spring, TX, she decided to get one. 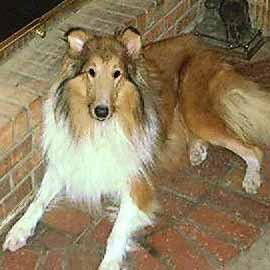 She found a collie rescue operation in Mississippi, and after several weeks of correspondence and a screening process, she was offered a three-year-old doggie named Troy. On Sunday August 30 she was going to drive five hours to Mississippi (near Jackson) and pick up her new companion. Instead, we evacuated from Katrina on August 29. Michelle was distraught throughout the evacuation, wondering how her dog fared, and whether she would still be able to adopt him. She eventually got in contact with the woman who runs the operation, and last Sunday she finally picked him up. The dog, tentatively renamed “Bastian,” has a happy new home in New Orleans now. Yesterday Michelle & I took Bastian for a walk through the French Quarter. Enough businesses have reopened to make the area at least feel like a “lite” version of its old self. We stopped to talk to various people. A tarot card reader who professed to also be a lawyer shared his conspiracy theories and pending lawsuits against the city. A street performer calling himself “The Broom Man” promised that his back-up band would return soon so we could see his act. A couple army officers from Missouri, stationed at Jackson Square, gave Michelle one of the famous MREs (Meal Ready to Eat) that have been distributed to local hurricane survivors. Countless people commented on Bastian (“Hey, Lassie!”), and Michelle is quickly learning to use him as a very effective flirtation device. She had been frustrated this past week with Bastian’s tendency for chewing any- and everything, and his apparent lack of house training. He’s a very sweet and affectionate doggie though, and yesterday his social value seemed to redeem his bad habits.